History: 70 year old man with leg pain. 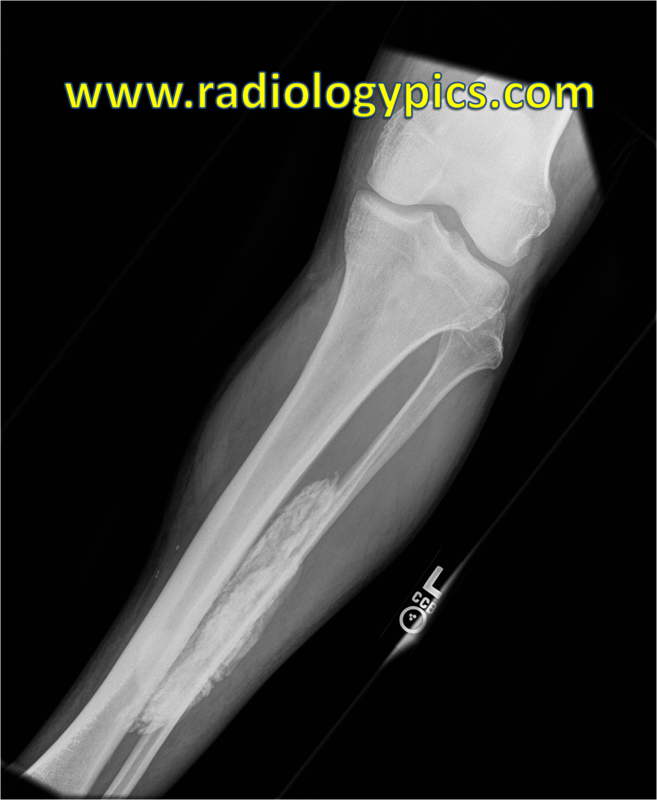 Calcific Myonecrosis: Frontal radiograph of the left tibia and fibula reveal a large sheet like calcified mass projecting over the left fibular diaphysis. See the CT below to see where this mass is located. 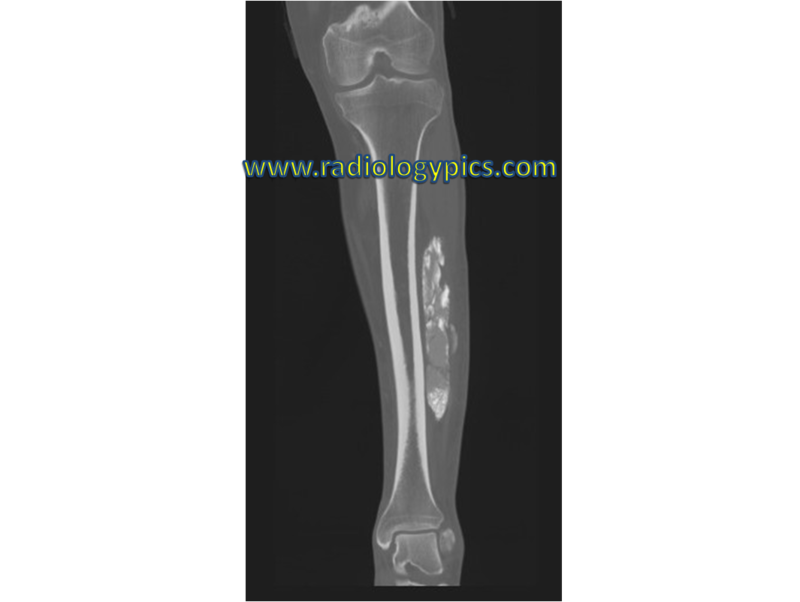 Calcific Myonecrosis: Coronal CT of the left lower leg reveals the calcified mass is in the anterior compartment of the leg, separate from the fibula. This is a case of calcific myonecrosis of the anterior tibialis muscle. Calcific myonecrosis is a rare late complication of compartment syndrome. This patient actually had a history of compartment syndrome 30 years earlier. The current understanding according to this article here is that compartment syndrome initially leads to necrosis and fibrosis, then continued hemorrhage into the muscle over time calcifies and forms a mass. Eventually this mass may herniate through the muscle and lead to the patient’s presenting symptoms of a mass in the leg or leg pain. Calcific myonecrosis occurs most commonly in the anterior compartment of the leg. The differential diagnosis from the plain radiograph image above would include entities such as parosteal osteosarcoma (however, not seen in 70 year old patients), myositis ossificans (also referred to as heterotopic ossification), sessile osteochondroma (though these are usually metaphyseal), and proliferative myositis. Another entity called tumoral calcinosis is defined as massive periarticular calcification of the soft tissues.